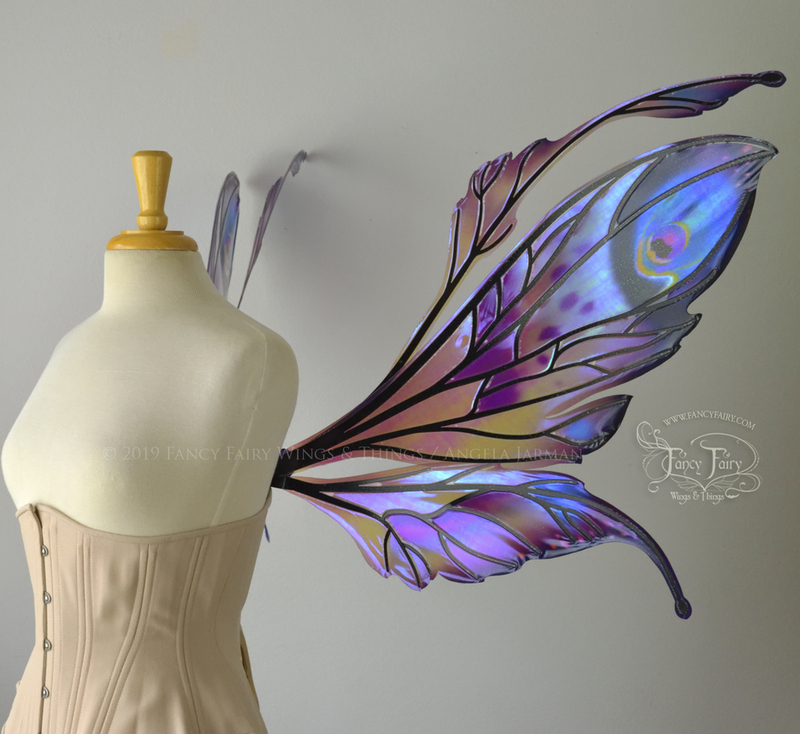 Surprise April Fairy Wing Sale! Surprise! These beauties will be listed tonight, Wed. April 3 at 8pm PST. Both of these are wings recently used in the photo shoot collaboration with Lumecluster, Yiaz Yang Photography, Dark Garden and Olivia Chiu! 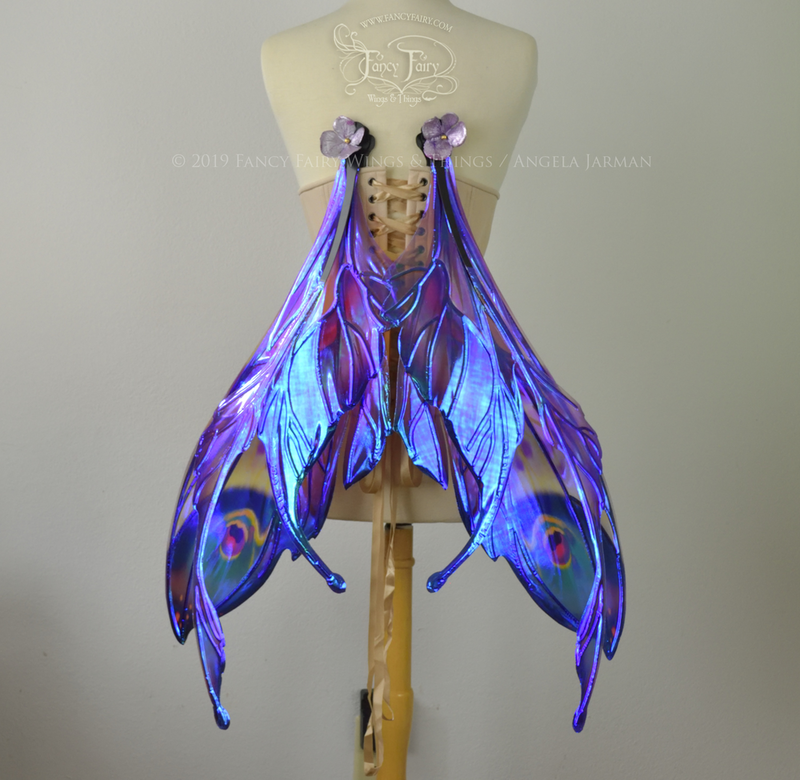 However, the XL Datura wings will be offered as Made to Order so there will be a wait time, but you’ll be able to choose all the colors! 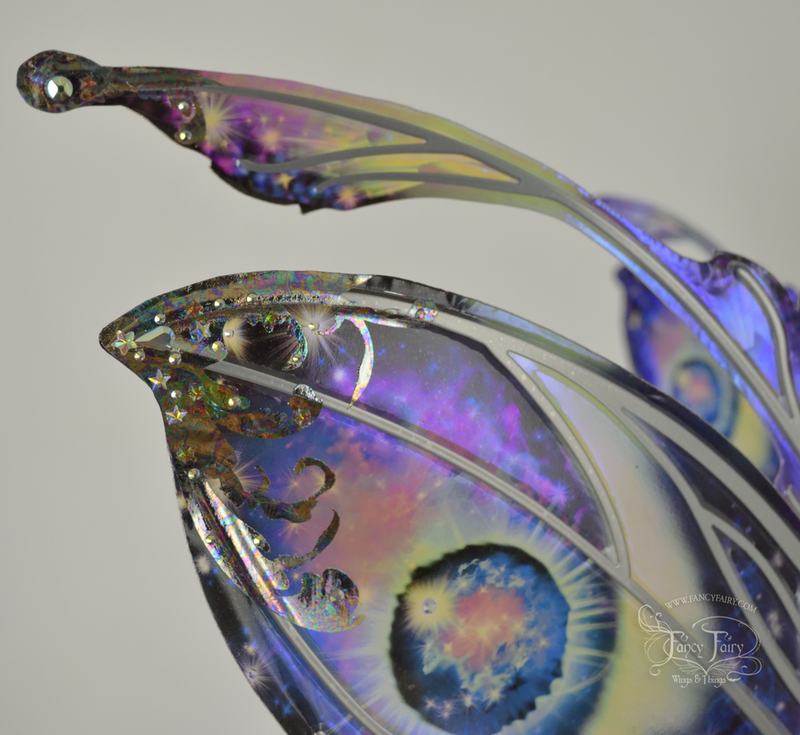 Let’s start with the Silver Oil Slick Celestial Datura fairy wings. I guess I can’t get enough of the starry skies theme, which I digitally hand painted and applied to the iridescent Lilac base film. You will find crescent moons made of aurora borealis light, nebulae and stars. A new ‘Oil Slick’ silver foil gilds the tips, which are further embellished by a mix of AB Swarovski crystals in star, pear and round shapes. The oil slick foil looks bright and silvery when reflecting, or almost oily black when not. 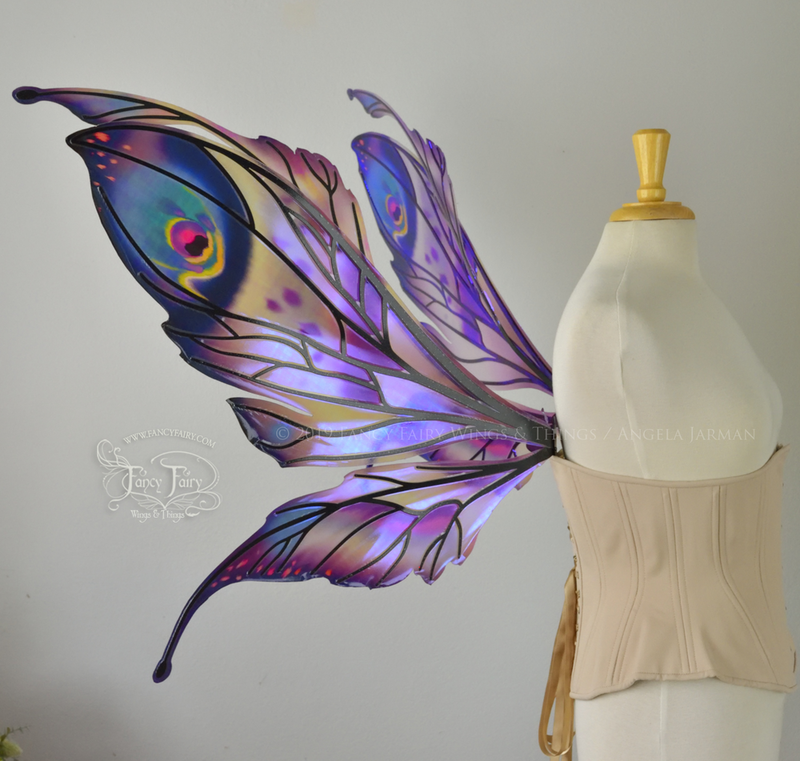 These wings are ready to ship. This next set will be made to order, because I for once am going to try to keep the ones pictured for myself since I sold the last extra large set I had been keeping for myself. 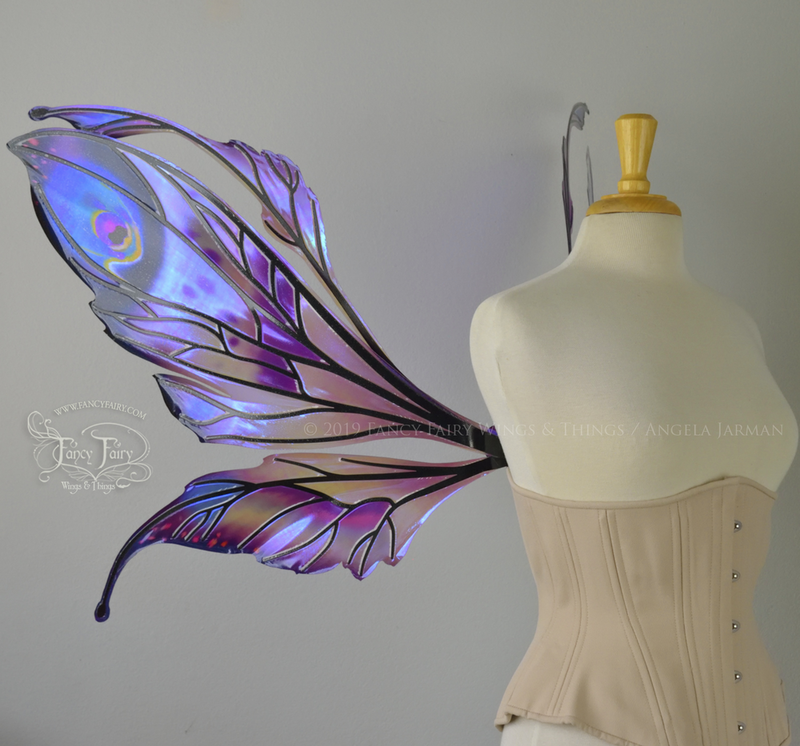 They are an extra large sized Datura wings, with subtle mauve, black and touches of bright color in a sort of butterfly pattern on iridescent Lilac. You’ll have to allow at least 6 weeks for production and delivery, perhaps more if you are outside the US. They’ll definitely wow people, and like the others are convertible so they can also be placed in the resting position. 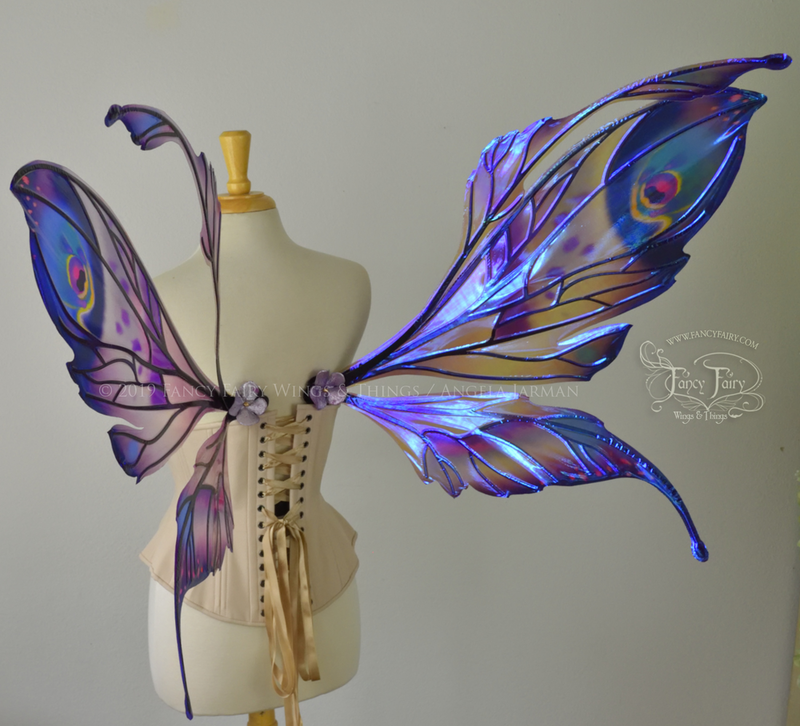 I may list another couple special wing sets tomorrow, so keep your eyes peeled and make sure you’re on the mailing list, which is in the margin on the right of this page, or if on mobile devices, at the bottom.